A simple process that has yielded extraordinary results around the world. One size rarely fits all, which is why we’ve used The Total Solution in implementations with clients over more than two decades and on five continents. Our experience has taught us that it is critical to understand you and your business at depth, have the ability to analyze what we’ve learned, implement our solutions, and reinforce the changes through constant effort. We start by learning your organization and its priorities. As we observe your business and conduct interviews, surveys and market research, we get a sense of both the top-down vision of upper management and the bottom-up perspective of your workforce. This step establishes the relationship, builds trust and credibility with your people, and accelerates buy-in and ownership in the development and deployment of new ideas. 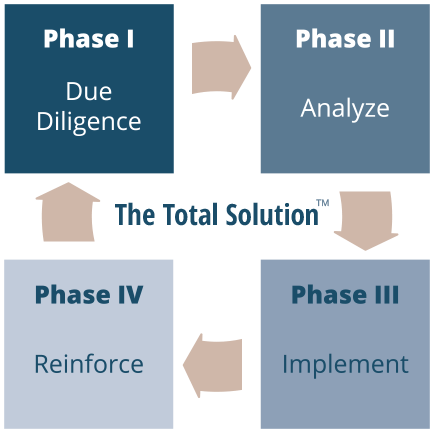 In this phase, we evaluate the assumptions, opportunities, and challenges uncovered in the first phase. We gather evidentiary proof through methods that include third-party research, behavior profiles, surveys, and our own proprietary tools. Summary findings are documented and compared to your organization’s direction and objectives. We use the analysis to develop strategic and tactical implementation plans in line with your organization’s needs. Implementation is different for every client. Strategies and tactics that address key business issues can be executed solely by you or in tandem with our consultants. If you find yourself short on resources, we can also deploy interim subject matter experts capable of accomplishing your plan while they grow your talent pool. The goal is to make sure things get done while we help build your bench strength. We continue to support your success with tailored follow-up strategies. You determine the level of our post-implementation involvement. It can range from occasional consulting to customized leadership development strategies. Ultimately, our aim is to maximize your investment by facilitating a smooth transition from where you are to where you want to be.